Wow! How time flies. It only seems like yesterday since I was wishing you all a Merry Christmas. I trust you all have had a lovely festive season and are looking forward to getting back into some kind of routine again. I have had a wonderful time at home with my family enjoying lots of games, visiting, carol service’s, nativities, present opening and its been a great time to rest, recuperate and of course plan for the new term. Also 2 great Christmas workshops. One with Melody bear where we tip toed across the roof tops, jumped down chimneys, galloped like reindeer, made reindeer food and ate many biscuits. The 2nd was with the senior tappers where we spent 2 hours creating a super fast routine to ‘step in time’ from Mary Poppins. We didn’t quite finish the routine but had lots of fun and burn’t off a lot of energy. Sadly we were all so busy i didn’t take a single photo. We have a busy term ahead of us with a spring exam session planned and beginning to make plans for our summer show in July. Also watch out for some rather exciting workshops coming up for February half term. Classes Start back this coming Monday 7th January and I very much look forward to seeing you all and hearing about your Christmas break adventures and to wish you a Happy New Year. First, apologies for not posting for such a long time. I honestly forgot that this part of my website existed. Whoops! Its certainly been a busy 12 weeks since I returned to work in September. I can’t say its been easy getting a work life balance after 6 months of being a full time mummy to my now 3 boys, but it has been absolutely wonderful to get back to my dance school and teaching all of you. Seeing lots of returning faces and many new ones has been very heart warming. Baby Albert has also thoroughly enjoyed meeting and having cuddles with the dance school family. 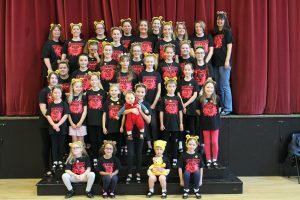 November 18th was this years Children in Need Tapathon day with 34 tappers from Dance with Dash taking part and 7,494 as a whole taking part in this nationwide event. A truly staggering amount of 36,700 pounds for Children in Need was raised with a further 137 pounds and 52 pence raised on the day through our refreshments stall. We all worked so hard for this event and I for one really hoped that we may just break that world record this year. Sadly however we were 102 people short of the record. On the bright side, it does mean I will be re registering again for the 2019 event and we can all have great fun learning and accomplishing a new routine. With 102 new faces joining us! This term ends on Saturday 15th December for our Christmas break. Please do come in to classes this week and see how your children have progressed over the last term. There really has been a lot of hard work going on and i will be applying for a spring exam session. Sadly no Christmas show. It was just a little to much to pull off after 6 months of no classes and so many new faces, but… a Summer show is now in the diary! This festive break , Melody Bear is having a Christmas fun session on Tuesday 18th December for 2-5 year old’s. Please do pre book this as i only have 12 spaces available and would hate to disappoint. I am also offering a workshop for senior tappers on December 28th for those who really miss dancing (me) over the break. Again pre bookable as entirely dependent on numbers. I know i have missed out those juniors in the middle but i also have some exciting workshops for you on the cards for the New Year. Thank you all for your custom and I wish you all a very Merry Christmas filled with family, love, laughter and an abundance of chocolate! Gosh is it me or have the summer holidays flown by this year? The new term starts back at Dance with Dash the week begining Monday 7th September with our new timetable running from then. I am really looking forward to seeing you all and getting back into some kind of routine. If you are thinking of joining us or maybe trying a new dance style then please get in contact to book a free no obligation trial class. If you are needing new dance kit for the new term then drop me an email as i will be placing an order Tuesday 1st september! Lots of new grades underway also following dance exams in June. Again 100% pass rate with fantastic results. 8 Distinctions, 22 Merits and 1 Pass. I am now looking to September and the new September timetable and dates are now live. We have a new Pre-Primary Tap at 9.30 on a Saturday plus Adult ballet and a few time changes foloowing exams and higher grades. I am aware I am a pre school class short and am hoping to add another soon to a Monday afternoon?? Please dont forget to pick up a new time table and newsletter from me before the term ends. Dance with Dash are also registered to take part in the Children in Need Tapathon, via The performers project again and we will start rehearsing for this over the coming months. This years routine is to 'uptown funk' Let me know if you want to take part, everyone is welcome whatever your ability. I hope you had a great Easter. It was wonderful to catch up with many of the youngest members of Dance with Dash for Melody Bears teddy bears picnic at the end of March. The timetable is running as normal this term with the exception of Thursday 14th May when there will be no Grade 4 ballet due to the Amateur dramitics performance. Dance exams will be taking place on Sunday 14th June and letters with details of these will be with you soon. I am running a free adult ballet class on Thursday 21st May 7.30-8.30 at The Townsned hall so please book on if you are interested. I am then hoping for this to be a regular class from Thursday 4th June. To end the term on Saturday 18th July we will be having an informal sharing performance and picnic at The Townsend hall. Looking forward to seeing you all and also some warmer weather!